The W3R Add-on Receiver is an expansion kit for your W3 Wireless Audio Adapter. You can add up to 2 W3R add-on Receivers for a total of 3 zones. It connects wirelessly to your existing W3 setup, and can output great sounding audio to any product with mini-jack or RCA audio connectors. 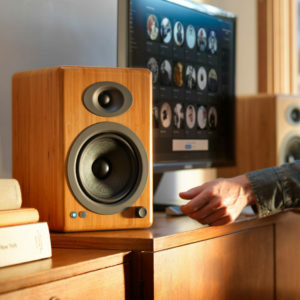 Add sound to an additional room, or even make your Audioengine S8 Powered Subwoofer wireless. Can the older W1/W2 and the W3 work with each other? Due to upgraded chipset in the W3, the W1 and W2 are not compatible with the W3 and will not work together. What wireless technology does the W3 use? Is it RF, FM, Bluetooth, 802.11, or something else? The W3 is based on a proprietary wi-fi technology that uses the same frequency bands as 802.11. Can W3 be used to send music from my Onkyo surround sound receiver to a pair of Audioengine powered speakers for rear surround speakers in a 5.1 system? Yes, simply connect the W3 Sender to the rear channel preamp outputs on your surround receiver then connect the W3 Receiver to an input on Audioengine or any other powered speakers. The W3 has stereo (1/8") inputs and outputs that will also connect to RCA connector with the use of the included RCA Y-cable adapter. Can I set up wireless to my Audioengine S8 subwoofer and then another W3 wireless Sender/Receiver pair to my A2 speakers? Yes, you can use multiple W3 sets (up to 8) to send stereo audio to different locations or up to 3 receivers with one sender unit. Where can I download drivers for the W3? The W3 is a USB Plug-and-Play audio device. This means that the drivers it uses are developed and provided by the developer of your computer's operating system. In the case of a Windows PC for example, these drivers are provided by Microsoft, and are a part of Windows. What makes Audioengine wireless products better than other wireless systems? The features that we feel make our system better than most wireless products currently on the market are the overall ease of setup, fixed low latency, audio quality, lack of dropouts, and high interference tolerance - all the good stuff that's important for a wireless product to be of any real use. I'm interested in the W3 wireless adapter and the A2+ speakers to extend TV sound into another room. Can I do this? Yes, connect the W3 Sender to the line-leve outputs or headphone jack of the TV and the Receiver. You'll need a second USB power adapter or iPod charger for this application. These power supplies are inexpensive and can be found at your local Radio Shack or electronics store. How can I switch between my computer speakers and the W3 on my Mac? Easily switch between speakers and W3 in the Status Bar on a Mac without having to go into System Preferences/Sound to change inputs and outputs with the Audio Switcher program available here: spikesoft.net/downloads.php#as. What is the latency (audio delay) of the W3 system? The W3 latency is under 20ms so it's perfect for using with video - home theater surround or basic 2-channel audio. Can I use the W3 for my podcasting studio? I want a wireless mic to my computer's audio input? Sure, this is a great application for the W3. You can use the W3 to replace any RCA or mini-jack cable, with or without a computer! Does the W3 transmit a stereo signal? Yes, each Sender/Receiver W3 pair transmits 16-bit stereo audio. Why is only 1 AC power supply included with the W3? We agonized whether or not to include 2 chargers in the box but figured that most people these days are very likely to have an extra USB charger or two from an old smartphone or tablet. These power supplies are inexpensive and can be found at your local Radio Shack or electronics store. We also have extra USB adapters available through our web store - http://audioengineusa.com/USB-Power-Adapter. Can the W3 (and W2) handle streaming lossless audio file formats such as Apple Lossless? Yes, both wireless adapters transmit any audio file format with no compression or loss. Why don't the W3 Sender and Receiver include rechargeable batteries inside? 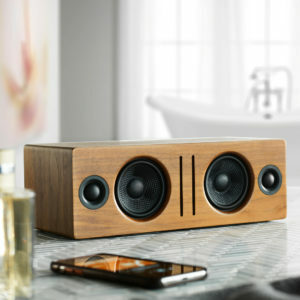 We considered adding batteries but decided not to as this was primarily designed as a wireless connection from your stereo receiver to a subwoofer or from a laptop to your stereo or powered speakers. There are, however, 3rd-party battery packs available and a quick Google search will turn up some inexpensive options that work great! Do I need to install any drivers for the W3 wireless adapter? The W3 is a USB Plug-and-Play audio device. which means that the drivers it uses are developed and provided by the developer of your computer's operating system. Because of this, you shouldn't need to download or upgrade any drivers to use your W3. Does the W3 adapter work in a car and if it does, how so? If you car has an auxiliary input on your car's stereo system (either 1/8" or RCA), then simply connect the W3 Receiver to a USB car power adapter and the audio output from the W3 Receiver to the audio input on your stereo system. Will any USB power supply or charger work with the W3? Yes! As long as it can provide at least 250mA, any USB power supply or smartphone / tablet charger should work just fine to power the W3 Sender or Receiver. Can I use my computer speakers and the W3 at the same time? The W3 essentially acts as your computer's sound card; so it is an either/or option, you either select your internal sound card to use or the W3. To use your computer speakers you simply select the sound card in your device settings or remove the W3 sender unit from your computer. If I have 2 USB ports on my computer can I connect 2 W3s? Two W3s can be used on one computer if you have two free USB ports. You would need to change the selection in your computer's audio preferences to switch between each Sender. Also, make sure to leave at least 6 inches between the units so there is no interference. W3 has a USB connector on the Sender and another on the Receiver. Does this mean that 2 computers required? No! You don't need a computer to send wireless stereo audio - just power for the W3 Sender and Receiver dongles and RCA or mini-jack inputs and outputs on your music gear. I own a Sony 7.1 STR Receiver and would like to use the W3 Wireless Audio Adapter to send a surround sound signal to my Audioengine A2 speakers. Can I do this? 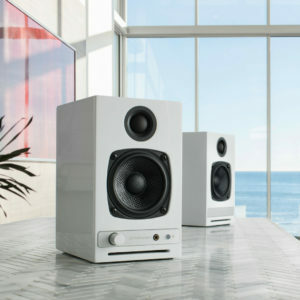 Sure, as long as your amplifier, preamp, or receiver has RCA preamp outputs you can connect the W3 to send wireless music over to your A2 powered speakers. Very cool! The W3 seems to be designed for a computer but can I also send audio from a stereo located in one room to powered speakers in another room? Yes, each Sender/Receiver W3 pair transmits uncompressed stereo audio from a computer or any analog audio output. If I plug the W3 Sender into my computer's USB port do I also need to connect a cable from the Sender's input into my Dell laptop's headphone jack? No, the W3 Sender will transmit USB audio directly to the Receiver so there's no need to connect to the headphone output on your computer. I'd like to watch TV via headphones so that I don't disturb others and I have a Bose headset. Can I send wireless audio via the W3 wireless adapter from my TV to my Bose Quiet Comfort headphones? Yes, the output of the W3 works great with headphones and you can control the volume with the TV remote. I would like to use the W3 to make my subwoofer wireless. Can I do this? Sure. Connect the W3 Sender to the subwoofer outputs on your A/V receiver and then connect the W3 Receiver to the audio inputs on your subwoofer. There are stereo 1/8" mini-jack inputs and outputs on the W3 that will allow you to make an RCA connection with the use of a Y-cable (which is included). Can I use the W3 with a music source other than my computer? Absolutely! Many of our customers use the W3 with their MP3 players, stereo receivers, CD players, powered speakers, satellite radios, etc. The W3 Sender and Receiver units connect to any gear that has an audio input and output (or headphone jack). I'm interested in the W3 wireless adapter and the A2 speakers to extend TV sound into another room. Can I do this? Yes; you would need to connect the W3 Sender to the line-level outputs or headphone jack of the TV and the W3 Receiver to the analog input of the speakers. You'll need a second USB power adapter or iPod charger for this application. These power supplies are inexpensive and can be found at your local electronics store. Will the W3 Wireless Audio Adapter accept an amplified speaker signal from a power amp? The W3 replaces any "line-level" RCA or mini-jack audio cable but is not designed to connect directly to powered speaker outputs. How do I use the W3 to get music to different stereo systems around my house? To do this you would use multiple sets of the W3 to send wireless music throughout your house. We have customers that daisy-chain the W3 (and W2) together from the output of one audio system - your stereo or our powered speakers in the living room, for example - to another system in another part of the house such as a Bose Wave radio in the kitchen. This way you can either control audio from their computers or iPods, or even without a computer from any other audio gear depending on how you connect the W3 Senders and Receivers. What is the lowest frequency that the W3 will pass? I want to make my subwoofer wireless and need to confirm they will transmit a low frequency signal, i.e. down to 20Hz. The W3 will easily handle low frequencies and is designed to transfer all music without any compression of loss. If I have the W3 can I send audio to my passive rear channel surround speakers? Sure, as long as you have a power amplifier to power your passive speakers, the W3 will work. Can one W3 Sender transmit music to more than one wireless Receiver? The W3 can transmit to up to 3 receivers simultaneously. I use Apple's "Remote" application on my iPhone to control iTunes on my MacBook Pro but can I also use your W3 wireless adapter to get music from my computer wirelessly from my computer out to my stereo? Yes, you can control iTunes with your iPhone and then send music from your Mac or PC out to your stereo system with the W3. 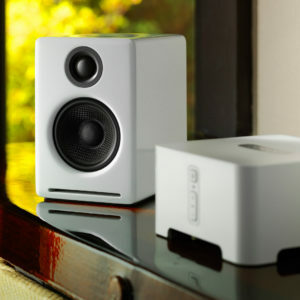 Think of the W3 as an inexpensive way to get really high-quality wireless audio anywhere around the house. And no need to buy new gear as you can connect the W3 to all of your existing audio components. What is the full frequency response of the W3 and what do the frequency numbers shown in the W3 Setup Guide mean? The full frequency response is 15Hz to 22KHz, +/- 1.5db. The numbers shown in the W3 Setup Guide are measurement points and not related to the overall bandwidth of the system. There's not need to show a spec for frequency range as the system transmits uncompressed PCM stereo audio (CD-quality) over using a protocol specifically designed for audio. The Audioengine W3 has 2 USB connectors, how do those work? The USB connector on the Sender transmits USB audio from your computer OR you can plug any input into the audio connector on the other end (an iPod, stereo, etc.). The Receiver part is powered by a USB power supply or charger and sends out analog audio. Just keep in mind the W3 will work anywhere you want to replace an RCA cable or 1/8" mini-jack cable with wireless! If i purchase multiple W3 sets will they interfere with each other when used in the same setup? Up to 8 W3 sender receiver pairs will play well together as long as you keep a minimum of 6 inches between each unit.